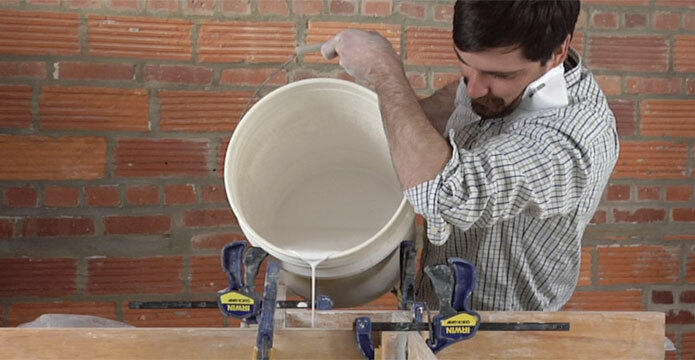 Mass Ceramic Production - Is it Right for You and Your Pottery? Why would someone who has spent most of his adult life pursuing excellence in handmade pottery enthusiastically pursue mass ceramic production? That’s the question potter/ceramics consultant/inventor/entrepreneur David Pier asked himself when he faced the conflict of wanting to meet high levels of craftsmanship and design, but still keep the pricing on his pots affordable. So, he explored the option of mass ceramic production for his work. What he learned from this experience might surprise you (and, if I know my readers, it will definitely spark some debate). In today’s post, David tells us all about his forays into mass ceramic production. – Jennifer Poellot Harnetty, editor. My career in ceramics started in one of the standard ways, falling in love with ceramics after taking a college course to satisfy a general education requirement. I added an art major to my chemistry major and later earned an MFA, with the intent of being a studio potter and a ceramics professor. I taught at the college level for ten years, loved doing that, and I hope to do it again someday. I have also maintained a studio to this day, for a total of about 20 years. Learn to make and use bisque molds and plaster molds, plus get casting slip recipes when you download this freebie, Ceramic Mold Making Techniques. From early on, however, I felt a conflict between my desire to perfect my designs and my desire to price pots low enough that the price would not negate their functionality. I never bought into the dogma of the humble potter, but I also wasn’t happy making only pedestal pieces for collectors. While there are obvious shortcomings in the quality and design of most mass-produced items, I never disapproved of the concept of mass ceramic production. In fact, as my work developed over the years, I started to wish I could have my items mass produced! While I understand the many positive attributes of the unique or limited-production handmade pots, I also value the benefits of mass production. There are many thoughtful people with good taste who also have small incomes. Although their discretionary funds are limited, these people still wish to create a well-considered and beautiful environment for themselves. Just as limited edition hand-bound art books have their place alongside the modern mass printed book and e-book, handmade and mass produced ceramics don’t necessarily conflict with each other. There is a need for something between the $50 handmade pot and the 50¢ Wal-Mart pot. At the National Council on Education for the Ceramic Art conference in 2006, Ian Anderson mentioned to me that he had spoken with Ed Weiner at Maryland China about the possibility of self-financed mass ceramic production. I had always imagined selling or leasing my designs to someone else, but I quickly came around to the idea of paying for the venture myself. I spoke with Ed and, before long, I had paid $500 to have a prototype of my coffee cup produced. I had a lot of confidence in my design, since hundreds of people had paid $75 retail for one without a saucer. Although the mass-produced cups wouldn’t have the brightly colored glazes of my originals, I figured thousands of people might pay $20 for one with a saucer that doubled as a lid. I felt that the commission that Maryland China would charge was well worth the security of dealing with a long-standing family business in the United States, as opposed to sending my money overseas without much recourse. If I had felt qualified to deal with Chinese factories, I would have done it earlier on my own. Maryland China also has relationships with factories that use a wide range of materials and processes, so they can choose the right factory for the job. They have extensive experience with importation and get volume discounts on freight rates from the port. Pay the development fee and send one of the cups I had cast myself. Use my savings to order a minimum production run of 2400 pieces, which would arrive in a few months and be warehoused and shipped by a third party, leaving me with all of the time I had before-but with an extra income stream. Like most of the big projects I’ve taken on, being overly optimistic was necessary to get me started. This prototype, which Pier ended up producing himself, includes a sprue (the extra reservoir at the top of the mold) that is inset from the edge of the lip in order to define the curved shape of the lip. Without this, too much variation in that curve was happening in the manufacturing process. The first thing that went wrong with the plan was that the factory wasn’t able to make the accurate scaled-up replica necessary to accommodate the porcelain shrinkage. The model maker “fixed” my design by making the body round, among other changes, when, in fact, the oval shape is an important visual and functional feature of my design. So, I had to spend 30-40 hours to make the master model myself. The next prototype followed my design much better, but the wavy rim had been cut without an understanding of the design. If even the model maker couldn’t execute this element correctly, I could see that my old studio method of doing it by eye wouldn’t work in the factory. The line of the lip needed to be dictated by the casting process, so I quickly came up with the idea of adding an additional top mold piece that, when removed first, would provide a guide for accurate rim cutting. The third prototype finally met all of my requirements. On the positive side, except for some shipping costs, all three prototypes were covered in the development fee. Without my previous experience with mold-making and casting, the development process for my unusual design would have been just about impossible. I was impressed by the whiteness and translucency of the porcelain. I requested bisque samples and found that all of my glazes worked great without modification. The Chinese porcelain was better than any material I could get for use in my own studio. The saucers are pressure cast, a process in which very thick slip is forced into this gang mold under high pressure, and is released through vent holes on the bottoms of the saucers. Pressure casting allows for greater detail and density in the final casting. Here, the slip that is pushed through the small vent holes is being removed before de-molding. There were some small compromises to the form that mass ceramic production dictated. The transition from the handle to the body at the top is seamless in my studio cups, whereas the factory cups have a visible line. Inside the cup, where the bottom of the handle joins the body, there is a small pocket. It is easy to clean, but it is disconcerting to some that the surface can’t all be seen. We ended up casting the cups a little thicker than the factory usually does, in part to reduce the size of that pocket. The thicker cast actually makes the cups more functional in most respects, such as heat retention and strength, so it is only the remaining pocket that is a compromise. When I learned of the quantity discount on a larger order, I increased my order to 4600 pieces, including 1000 unglazed. About four months later, the shipment arrived (to my billing address, rather than to the storage space as I had desired). When I opened the first box, I was very pleased. The result was better than I had originally imagined. Later, upon examination of more of the cups, I found that quality control was not what I would have hoped, and there were many pieces that could not be sold at full price. Many also required a little foot polishing to make them table-safe. I later negotiated a credit for some of the most defective pieces, and the quality control in later orders improved dramatically. I learned that the contract needs to be explicit about acceptable defect rates. I realize now that factories will never come close to 100% perfection at an affordable cost. This revealed the biggest flaw in my original idea of how the whole venture would work. The flaws meant that a third party fulfillment agent, without expertise in ceramics, was impractical. The economics of the resale still worked out well, but I would have to do more of the work myself. After slip casting, the cup is allowed to dry somewhat before trimming off the sprue and removing mold seams. In the end, Lux-Delux Design became a one-man show. I designed the logo, photographed the cups, built the website to sell them, I warehouse the cups in my house, and I do most of the packing and shipping myself. At the beginning, there was a lot to figure out. Quality grading, pricing, web design, web placement, packing and shipping methods, freight shipping for larger orders, customs and duties for international customers, inventory systems, taxes, decals, return policies, and many other details. After two years of selling them online, I now have the process refined to where it takes me an average of just over one hour a day to deal with all of the coffee cup business. I occasionally hire a neighbor for a little help, and sometimes it takes up an entire day or two. I’ve found it lucrative enough that I ordered more of the 12 oz. cups from the factory, as well as adding a smaller 8 oz. cup. My coffee cup website is a critical part of my mass-production success. I have always been comfortable working with computers and have enjoyed building up my photography and writing skills over my years as a potter. Selling on the Internet is not the only way to approach a mass-production project, but it is an approach that has allowed me to make use of my creativity and several skills that I enjoy. It is important to be realistic about what you can and cannot do yourself, and to take into account the costs of hiring others to do the things you cannot. Someone else might find success by directly approaching museum shops and other resellers, perhaps using the prototype to line up orders before investing too much money. I’ve found that I enjoy interacting with my customers by email, and I am more comfortable being in control of the image projected over the Internet. I am pleased knowing that thousands of people now get to enjoy my design, and the cups are a pretty good approximation of what I would have made with my own hands. I didn’t have to cast thousands myself, freeing up time for my studio and other projects. The cups have received exposure on consumer product and design blogs, which my studio pottery never would have received. That exposure has elicited interest for my design-for-fee services, so my self-financed mass ceramic production has been an unusual entry into the design world, allowing me to spend more time doing what I’ve always enjoyed the most. Perhaps the most practical result of this project is that my income is more stable than it would be if I were only selling my higher priced studio work. For further information on the Ultimate Coffee Cup, see www.davidpier.com. David Pier is a ceramics consultant and potter living in Chapel Hill, North Carolina. Because of this project, he has been able to pursue his new invention, the HoundRound dog exercise wheel (www.houndround.com). art, bisque, body, bound, box, building, career, cast, ceramic, ceramic art, ceramic production, ceramics, charge, chemistry, colored, concept, cup, cups, cut, david pier, design, designs, detail, dry, element, entry, experience, exposure, feature, foot, form, functional, glazes, guide, handle, handmade, handmade pottery, heat, image, information, mass produced ceramics, materials, mold, mold making, pieces, polishing, porcelain, pot, pots, potter, pottery, printed, process, produced, product, project, prototypes, question, reduce, return, safe, shape, shrinkage, size, slip, slip casting, storage, studio, studio potter, studio pottery, surface, table, taxes, time, transition, translucency, trimming, value, wide range, working. According to the droves who have eternally penned their bigoted remarks on the internet they believe David is anti-American, anti-Chinese, anti-artist, a greedy rich capitalist, not an artist anymore, a slave labor supporter… Good job on the mugs David. If I could design something so beautiful I would also mass produce them in China! (Maybe someday I will! )… p.s. Please learn how to implement proper grammar and spelling people! Especially if you are going to passionately rant about something you so strongly believe in (i.e. the samples I wrote above) because sounding only semiliterate weakens your message. I dont understand why everyone is so against having their products produced overseas? IS it that someone else is getting employment when someone who doesn’t want a job anyway isn’t? Im all for using international manufacturers to produce my product, the money comes back to me and I spend it in my own country. I feel like I am helping people from a third world country earn an income. This is somewhat OT, but I’m not sure where to source the answer to this question. So I’m seeking any info on the Net that has to do with “going industrial” with ceramics. Our company is looking for an alternative to using a two plus gallon stainless steel water container in a water machine. It’s very expensive to make square stainless steel containers, so we currently use round moulds. My question to all of you and the author of this article is “Is it possible to mass produce a square ceramic container that can hold two or more gallons of water? Thanks so much for any ideas, info or suggestions of where to source a mfg for such a product. BTW I am not American. Surendera, I agree 1000000% – it appears you have not understood my point at all. I am saying the similar thing to you on this. USA and some of those here are being protectionist. Your Country is a signatory to the WTO, but refuse to follow what the theame of WTO. You want that Americans may do business whereever they like but do not aloow others to do business in your country. It is a free trade regime and any one can do business anywhere in the world without any restriction. If you do not like Chines things, do not buy them, chines will stop trading after some time. But you cannot stop China to come to America ne sell their wares. When Coca Cola, Pepsi go around the world and sets shops, in many countries, their own cold drink industry crumpled. Ever you bothered about that. No. The cups and saucers arrived today. I am truly impressed with the design and am very pleased with the way they feel. Your glaze is awesome, a feature in itself! As a potter, I have had issues with packing pottery and had an “eye opening” when your parcel arrived. It was an amazing revelation on perfect packaging. You might have a follow up article for Ceramics Arts Daily about the post potting requirements to ship. Evidently there is a fat expense in designing the right shipping container… Going commercial has so many facets. You have really mastered them all. I’m enjoying some hot chocolate and watching the TV, waiting for the approaching snow storm. Indeed, holding the mug (awesome deep glossy glaze) is such a sensual feeling that I look foreward to my next hot drink. Thanks for your care and personal touches when filling my orders. PS everyone, note he contacted local production specialists and THEY outsourced it since they knew more about the industrial details required for an unusual design/quantity etc. He is also got some bisque ware, and is experimenting with color. Nice blue, Dave! Panayiota, Roger L, Corbin, Linda and others: The point is not whether you read anger where I do, rather that people have freedom of choice in the pathway of their business. The idea of protectionism as a valid safeguard of home production is open to abuse: take subsidies for US cotton for example… does US play fair on that issue? Protectionism, which is really the direction you are facing, is a dangerous option and goes hand in hand with nationalism. What you are saying is that in this case he has made the wrong choice… why don’t you elaborate on that in a meaningful way and explore why you think so… and inform us as to where the real opportunities lie in USA? Do all of you who level this criticism, only buy American product? Of course not. The modern American nation was built on the concept of export. UK citizens arrived in a foreign land, exported themselves and did rather well out of it. Post WW11 NASA and the US military did rather well out of the German war machine also. Your nation has developed on the back of ‘freetrade’and today openly partake in OS trade on the one hand and come down on an artisan for participating in OS trading on the other. Open OS trading is therefore a fact of life that you slap in the lone trader’s face. It has been successfully embraced within human culture since early Indigenous social development first appeared on our historical map. It is not the cold object either that stands out in this argument but the overriding principle of equality and liberty for all. Protectionism dismantles the cooperation needed to continue not only trade partnerships but also international dialogue, treaty, peace, support, recognition and even aid. The Chinese military have started assisting in UN and related Aid duties over the past 10 years. They arrived in Haiti fairly swiftly. Protectionism lacks all manner of positive social perspective and serves only the misguided reactionary quarters that often come up short on domestic trade/social issues also. It is prejudice, near sighted and destructive. And what of the great American enigma upheld by people like Nike, Mohammed Ali, Tiger Woods (hmm), Phelps, the Williams sisters? To back protectionism would it not also require you to withdraw from the world sporting stage? Madonna, Lady Ga Ga, Elvis, Michael Jackson…. .. and then what of 200$ billion worth of gilts traded to the Chinese? This is the knock on effect that would reshape much more than the price of a coffee cup.. if people like David and I listened and dismantled our OS businesses it would condone the barriers we have seen come down. Freedom. If we adopted your protectionist world view our world view would be based on back yard initiatives that only maintain the insecure status quo that thrives in denial. Show me one artisan product that has succeeded by being manufactured at home whilst offering great VFM. The bottom line is working plurally does not automatically add up to great sales and turnover. But it means one has a greater chance of earning enough to get by, have some kids or lifestyle choices and even pay some federal taxes. So you can see the criticism really comes out of the wish to have the best of both worlds. That is why the criticism is essentially nonesense, ringing of jealousy and denial… mostly low register for sure, but persistent and real to those who can detect it. David has not lost a part of his artistic credibility but gained much else besides. I am sure he pays more tax then you guys too… a parting shot I know, but one based on reality. I don’t think anyone would argue that the design is beautiful and that it is art. I have to say that, I too, try to buy American whenever possible. I don’t think anyone is angry, Nick, that he is doing so well with his business, only that they would rather see him support an American production company. I don’t want to argue the point, only that I see the point of view from which they are coming. However, it is ultimately his decision to make them how he chooses and ours to buy or not to buy. As a young artist, I am amazed with the reactionary thinking among many of you. I have always been encouraged to make art for art sake not exclusively for the wealthy market. I’m really impressed with what David has done and believe ceramics needs to branch out rather than stick to a sedentary existence. There are many artists taking risks that make this the field I love. Don’t assume this was not one for David. I cannot believe those of you who are laying into this artist. Had he tried to develop this product for larger market share via US manufacture do you know what would have likely have happened? The pricepoint would have been too high. The product would have become noticeable and taken by a corporate retailer… copied and made for retail at 3 bucks max out of China, or Vietnam. Then would you have been happy sending him comments of how sad it is that he had been ripped off… but how he represents true blue USA values…?! Wake up! The guy is a ceramic artist, designer and design thinker. Admit it… he is allowed to build his career any legal way he likes… and what of the meaning of yr declaration LIBERTY??? Admit too that you have a different vision and give up on this stupifying dullard attack. The realities are that product development has huge risk from firstly domestic competition and the big 4 domestic retailers. This guy beat them to the punch and left you angry! Finally, it is a great design. That is the core element that has made this sku a success. Great work. I wonder how the “100’s of people paying $75 a cup without the saucer” feel about their cups now. I guess he doesn’t give a damn about them since he’s now making lots of money without his loyal collectors. He’s not a potter he’s a manufacturer!!!! I wish we were all more sensitive to the price we pay in greenhouse gasses for shippping (say nothing of our dependency on foreign oil), outsourcing, and the entire WalMart frame of mind away from buying locally what we believe we would like to have, collect, or actually need. It is my humble opinion that you sold your soul to the WalMart mindset in the name of offering your art at an affordable price. A very interesting and informative article. I will be buying a few of these cups as gifts. They are terrific! Thanks. Thanks for sharing this experience. You have been most generous with the knowledge you aquired. I am sure you got to where you are by trusting your inner gut feel and not by listening to other people. Congratulations! It’s obvious you enjoy what you are doing and that after all is what its all about. Your talent speaks for itself – may it continue to be your close companion on your journey. There is no dearth of jobs in America. tens of millions of foreigners are working in America and repatriating money to their native lands every month. Score of jobs are out sourced to other countries. Why? Are Americans incompetent? No. They care about the whole world. The Job loss in America is mostly in the engineering and the technological and financial sector. Art has nothing to do with recession. By making a artist responsible for the recessionary trends you are shying away from the original cause of recession, and putting a budding fellow in a doc. Art is a mind game and the artist must be set free to do what he likes and the way he likes. There are no binderies, cast, creed and language any barrier for him. How can we keep jobs in the country when no one here will even come close to $$$$ needed to make it worth while.If his work was reproduced here it would probably have to sell for the same price as the original.I doubt any of the union factories or even non union care about the artists side of it all.So if the chiese people do it, I guess they figure a low wage is better than no wage. It may not be fair but what is? Mass production by talented professional potters is the only way to raise the bar above the current sub-standard foreign products. A studio potter just can’t create such an impact on the global economy alone. To me, we as artists are first and foremost designers. Our “art” lies in the originality of our designs, and David Pier’s designs are indeed exquisite. Our craft lies in the production, and while I do not question David’s obvious skills, I feel that mass production is a different animal from hand-crafting. I would not purchase an art print from an edition of more than 100 (I prefer editions of 50 or less), because I feel that anything more than that makes the print a poster. I feel that way about mass production of pottery. I buy a mug (at least) from every potter I come across, and I have mugs from Walmart – guess which ones I reach for every time! I’m not immune to the frustrating constraints of studio production, and I’m not going to get into the subject of outsourcing. Just sharing my personal feelings. More power to you if you enjoy the mass produced designs. It looked like a lot of work to get this all going. Doesn’t it take some of the art out of the art though? My art is important to me. I don’t want someone else making my designs. But that is my opinion. No I am not rich and probably never will be but I am comfortable and people like my very individual style of clay work. I agree with a couple of the other comments, where are these cups mass produced? If this guy is pleased with his coffee cups being massed produced, cool. I just feel there is something missing from the art part of it being massed produced. It has somehow been cheapened. But again, that is just my feeling. Keep on trucking, dude! What a nice design. I also have a Studio in South Africa and is also doing Mass production on Coffee mugs,must say I have created 10 new jobs for our people here. And with the Campaign of Proudly South African I can be proud of making our own products here in South Africa. I disagree with Rodger, Corbin and Stephanie. The art work has nothing to do with the recession. Art always sells at a premium. To cut the cost, he has not taken away any jobs. Jobs were never generated when he was hand building. So there is no impact on recessionary trends. Whereas, he has given the world a novel idea. His product is still an art-ware and still selling at a premium (though a a lesser premium). Otherwise Coffee mugs are available a dime a piece. Kudos to David. I agree with Rodger on the idea of an American made object, i personally think your way of seeking mass production is a cop out. We are currently in an economic recession, and you have just further contributed to the problem by sending more jobs oversees. I you were so concerned about making affordable mugs for people to use on a daily basis, why not lower your price’s. There is many more options you could have explored before jumping on the band wagon, abusing cheap and abused laborers of china. Many thanks for the great insight into pros and cons of mass production – also the dilemma a lot of potters face. Exclusive one-off pieces are inspiring to create, but the consistency of sales I find is rather daunting. Why can’t a ceramicist/potter do a combination of all – slip casting, handbuilding, wheelwork, etc. the diversity is challenging to say the least. Here in New Zealand, we import (unfortunately) the majority of products from China, when we have the most amazing, innovative folks who have the philosophy of “we can do anything” attitude. Many thanks David – you have give us food for thought.!!! Love the cups and the website. I admire your quest to provide a product that more can afford, however sounds like the quality took a hit. Hence the saying., “You get what you pay for”. The cups remind me of the work of Eva Zeisel, Russel Wright, and Ben Seibel. The pastel candy glazes remind me of Lu-Ray Pastels. My only concern would be how long it will take before some other factory in China starts making knock-offs. There is noting wrong in gong for tha mass production of a novel design and distributing it at a cost much lesser that a special hand made edition. I ever worndeed how the art potter sustain and why the art posster do not go for mass production. David Pier did a wise decision. The piece he wrote is inspiring. Kudos! Beautifully done….and has got me thinking that maybe it’s time to use more of my brain and less of my arms. Roger, if you read the FAQ’s on the Lux-Delux website you will see that these are made in China. That being said, do you ever shop at department stores? Do you only buy locally grown food? Do you make your own clothes? Great article. This makes me want to try some myself. Great to see someone with multiple talents using them all (actually I suspect there are more!) There are thousands of studio potters out there, but only one David Pier. While I really like the cups and saucers in all their variations, the white reminding me of the industrially produced work of the wonderful Eva Zeisel, it is the dog-wheel that that could make David’s fortune. There is a TV program (unfortunately I can’t remember the name) that looks for inspired design that can lead to volume production and payment by royalty. Check it out. Congratulations on these exciting directions in your work. David, I just bought a mug. We have to share in our success. Can’t wait to get the mug! Wonderful article. As David notes there is a great debate over simplifying the struggle of production pottery. What is the disconnect or real root of the debate we have between mass produced work and one of a kinds? I think Christa Assad did her thesis on this. I’ve concluded that we long for a personal connection with everyone, thus production work can seem a bit impersonal. This is the real issue. If we look at printmaking, we see the same issues being raised. The original limited editions, one of proofs are always considered to be more valuable. These comments are not to take away from David and his work, as his eye for design is immaculate. I just wanted to add a kick to the wheel and spin the “mass production” conversation a little. I do hope to meet David and buy a mug soon. After reading this excellent article, MY QUESTION IS: Where ARE THE CUPS BEING MANUFACTURED? AMERICA OR ABROAD? I am a person WHO LOVES MY COUNTRY, has the ability to see the big picture, has the ability not to be lead by the ideologies of those presently attempting to gain contol over our freedoms, AND I, like MILLIONS WHO ARE NOW “SLOWLY” AWAKENING, possess the INSIGHT TO REALIZE WE MUST TAKE CARE OF OUR OWN HERE IN AMERICA FIRST! With this said, I respectfully ask again, WHERE ARE THOSE CUPS BEING MANUFACTURED?? America, China or other countries in the world? We must think about our citizens first and I apologize if I am assuming foreign manufacturing is taking place for a fantastic American designed product!